Summer is just around the corner, bringing luscious summer fruit and lots of jam making opportunities but first it’s time to use up the stockpile of last years’ sweet preserves. Our darling daughter visited us last Christmas and returned home with a goodly supply of preserves. Ten months later we visited her for her birthday. We checked out her pantry to write a shopping list for her birthday feast. I noticed that they had used up all the savory preserves but still had quite a few bottles of jam and marmalade unopened. She said they didn’t eat much toast these days. It was obviously time to use them up. 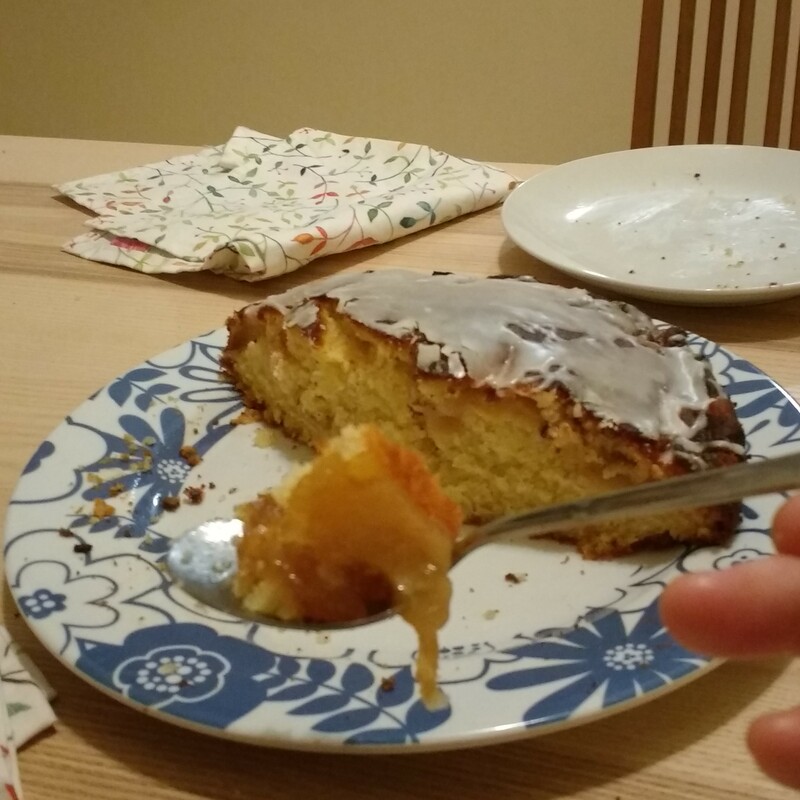 Holly’s favourite cake is a simple Apple Tea Cake so I decided to use up the Lime Marmalade to cook the apples. I peeled, cored and cut the apples in wedges before poaching them in lime marmalade. While they were cooking I mixed up a butter cake. I greased the cake tin with butter and sprinkled ground almonds on the bottom and sides. This makes the cakes slip easily out of the tin and gives a tasty crumbly crust to the cake which contrasts nicely with the soft buttery inside. I put half the batter in the tin, spread out the apples and topped them with the rest of the batter. When the cake was cooked and cooled, I iced it with a simple lime icing. I was very pleased with the result – the lime marmalade gave a lovely tang to the apples and off set the buttery birthday cake. So if you have a stockpile of jam and marmalade in your pantry – remember it’s not just for toast. Cream butter and sugar till pale and soft. Add eggs one at a time, beating well after each addition. Add about a third of the flour, stir to mix, then add some milk . Stir. Alternate with remaining four and milk until you have a smooth batter. Place half the batter in a greased 23 cm cake tin. Smooth, then top with the apples. Cover with the rest of the batter and smooth. Cook in preheated oven at 180 C for about 55 minutes until the top is firm and bouncy on the top and a skewer comes out clean. Allow to cool in the tin for 10 minutes before turning out on cooking rake. Ice when cold. Wash, peel and core apples. Cut each apple into 8 wedges. Place lime marmalade in wide shallow pan and warm gently. (If you have a bottle of grandma’s chunky lime marmalade and you don’t like the chunks of peel pass the marmalade through a sieve first 😊) Add the apple stir gently till apples and coated. Cook gently, stirring occasionally while you are making the cake batter. When the apples are soft, increase the heat to cook off some of the moisture. The apples will start to caramelise. Remove from heat. Sift icing sugar into small bowl. Stir in lime marmalade. Drizzle in warm water stirring constantly until icing reaches good consistency. It should flow off the spoon like thick cream. If you add too much water just add some extra icing sugar. Spread over cake. Tags: dessert ideas, Handmade, Jam, lovefoodhatewaste, marmalade, recipes. Bookmark the permalink.